Adamas Fine Jewelry | Jewelry Protection. Sound advice from the experts at Adamas Fine Jewelry. Taking steps to protect your fine jewelry is extremely important. Here are a few simple preventative and maintenance measures you can take to properly care for and prevent damage or loss to your fine jewelry. Where do you keep your jewelry when you’re not wearing it? Jewelry boxes and dresser drawers, as well as most any spot in the bedroom, are often the first places a thief will search for valuables. In your home, choose a hiding place that is inconspicuous yet convenient for you to find later. In-home safes are an excellent way to keep valuables protected. The safe should be located in an unusual place – like a basement or attic. Stay clear of the bedroom, again, this is the first place a thief will look. The best safes are ones that bolt to the floor, making removal nearly impossible. 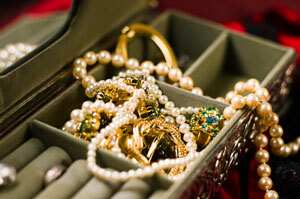 Consider storing infrequently worn jewels in a bank safe deposit box. If you don’t already have your fine jewelry insured, now is the time to do so. Most insurance companies require a separate rider on your homeowners or apartment renters insurance policy for valuables such as jewelry. This rider will allow you to provide an itemization of each piece with full descriptions and values thus creating a clear and accurate record of all of your fine jewelry. Should you suffer a loss and need to file a claim, your insurance company will have this information on file. If you plan to keep your jewelry in a bank safe deposit box you should still consider insuring these pieces. The premiums to insure jewelry kept in a bank vault are less than standard rates. So ask your insurance agent about this type of insurance coverage. A fine jewelry appraisal from a trusted jeweler will provide all the information necessary to insure your valuables. The appraisal should outline all the features of each piece of jewelry and provide a replacement cost value. An accurate and detailed appraisal will help determine the proper amount of insurance coverage needed for your pieces – ensuring that you are covered in the event of damage or loss. It’s important to have your fine jewelry re-appraised every three years as values will change with time and you want to be sure your pieces are fully covered at all times. Have your fine jeweler inspect your jewelry on a regular basis – at least once per year. This is especially true for items you wear frequently. Small problems like loose stones, worn or damaged prongs, and faulty clasps can be detected and repaired before they become bigger issues. So is your jewelry safe? Contact us at Adamas Fine Jewelry for a free jewelry assessment. We’ll be happy to answer your jewelry related questions. And, we offer expert repair and fine jewelry appraisals as well as advice about the best ways to insure your pieces. We’re here to help you protect your fine jewelry investment.